Every galaxy is surrounded by a mysterious halo that scientists currently know little about. A team of astronomers has recently used a new technique to map the structure of a distant galaxy halo that is located in between a giant background galaxy and a huge foreground gravitational lens — like a galaxy halo sandwich. We spoke to lead scientist Sebastian Lopez from the Universidad de Chile to find out more about the surprising results. Q. Firstly, what are galaxy halos and why is it interesting to study them? A: A galaxy halo is the "invisible" part of a galaxy which extends out well beyond the visible starlight. If the stars of the galaxy are the "main part", then the gaseous halo of some galaxies can extend out to ten times the size of this main part — measuring up to millions of light-years across. Each galaxy has this invisible halo that is really intriguing but very tricky to study. We believe these halos consist partly of normal matter in gaseous form — mostly hydrogen and helium — but also of dark matter, which is something more mysterious that we don’t yet understand. Galaxy halos are interesting to study for two reasons. Firstly because over time they collapse to eventually form star-forming galaxies, just like the one that we live in, and secondly because they remain enigmas. We want to crack them open and find out how they work, to learn more about the processes of galaxy formation and evolution! This artist’s impression shows the Milky Way galaxy. 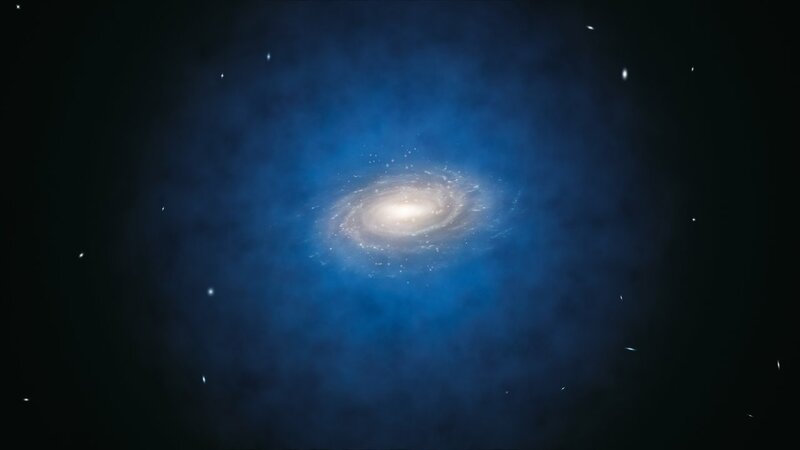 The blue halo of material surrounding the galaxy indicates the expected distribution of the mysterious dark matter. Q. So how and when were galaxy halos discovered? A: In 1920 there was a huge discussion — fittingly called “The Great Debate” — between two astronomers, Shapley and Curtis, about whether some observed distant nebulae were truly clouds of dust and gas within the Milky Way, or whether they were actually independent galaxies much further away. The latter option, supported by Curtis, turned out to be correct. Astronomers suspected that these independent galaxies would each have a gaseous halo. However, the first real detection of a galaxy halo outside our galaxy wasn’t until the late 1960s, when John Bahcall and Edwin Salpeter looked at distant quasars and found mysterious red-shifted absorption lines, which suggested that some of the light had been absorbed by gases in an intervening galaxy halo. Q. Did astronomers continue to use quasars to study galaxy halos? A: Yes, for many years! Quasars are a special kind of extragalactic object that can be found at the centres of active galaxies. Their energy is produced by material falling into a supermassive black hole. Because they can shine as brightly as 10 000 normal galaxies, we can observe quasars that are extremely distant (the most distant known quasar is so far away that it has taken almost the entire lifetime of the Universe for its light to reach us). Light from distant quasars passes through intervening galaxies and therefore travels through galactic halos on its journey to the Earth. Every time this happens, the halos imprint their signature — a kind of fingerprint — on the quasar light in the form of absorption lines in the quasar spectrum. Analysing the properties of these lines gives us information about the gaseous halo of intervening galaxies, which would otherwise remain invisible. 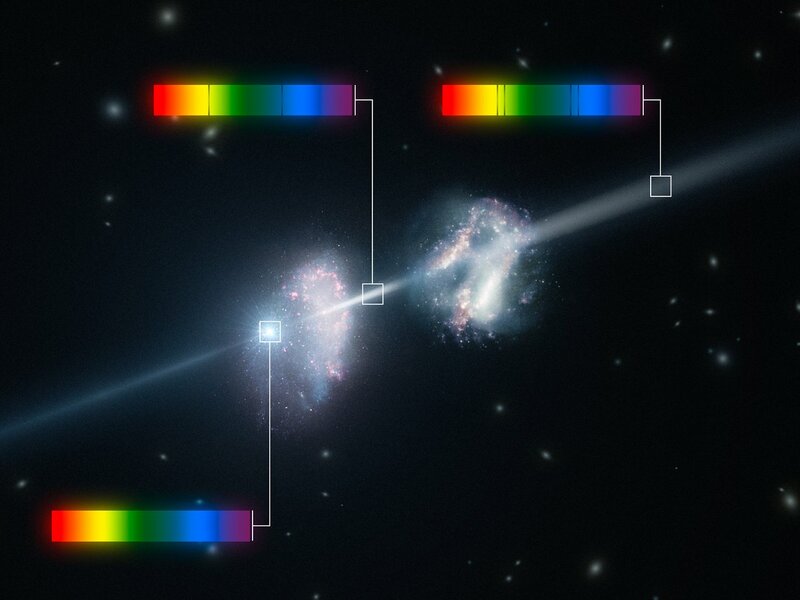 This artist’s impression shows that when light passes through intervening galaxies, certain wavelengths are absorbed, leaving a signature in the absorption spectrum. Q. That brings us to your research — tell us about your new technique to study galaxy halos. A: Over the past decades, our ability to capture the spectra of quasars has improved enormously. Astronomers can now build a much better picture of the gas structure around galaxies. However, a quasar is so distant that it looks as small as a star, so this technique is a bit like probing one narrow pencil beam through a galaxy halo. That’s where our technique comes in. 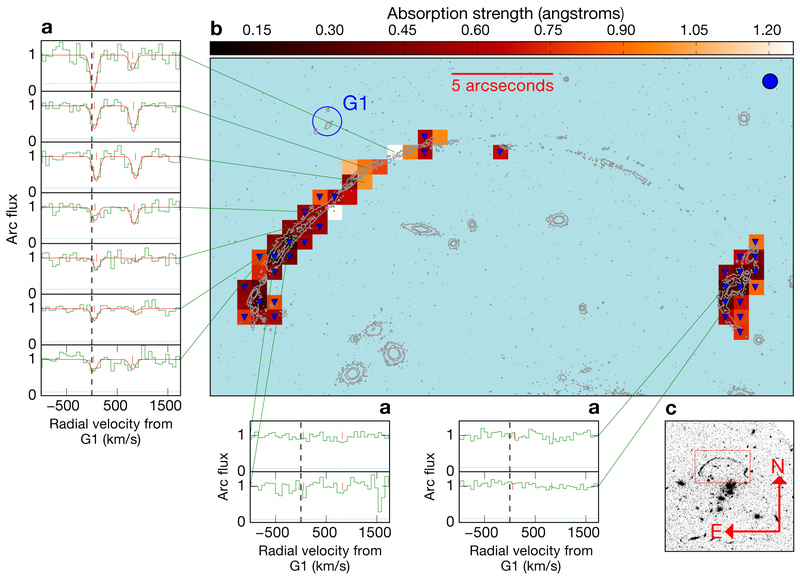 Instead of looking at a quasar through a galaxy halo, we decided to look at a much larger background object, so that we could investigate the whole structure of a galaxy halo in more detail. We made use of an effect called gravitational lensing. Massive objects are capable of curving spacetime; when light passes close to those curved regions of spacetime, it follows the curvature so that the light rays appear to be bent and magnified. This is important because in our study, we could observe a distant galaxy more easily since it was being magnified (and distorted) by a foreground galaxy cluster. The result is a very extended arc on the sky. This project therefore combined expertise from two different areas of astronomy — in the circumgalactic medium and in the field of galaxy clusters. Q. Talk us through exactly what you studied. A: Some of our team members had previously found a distant, giant, and very bright gravitational arc, catchily known as RCS2 032727-132623. This arc is the image of a background galaxy, gravitationally lensed by an intervening galaxy cluster. In between this background galaxy and us is another little galaxy system, which we named G1. When light from the arc passes through the halo of G1, G1’s absorption signature is imprinted onto its spectrum. Now, this is the cool part: because the giant arc is so extended across the sky, its light travels through a large area of G1 (unlike a quasar’s narrow beam of light). By studying this arc with the MUSE instrument on ESO’s Very Large Telescope, we could pick out lots of individual spectra that showed “fingerprints” from many different places in the halo of G1. For each spectrum that we obtained, we looked at the signatures of magnesium in the halo of G1, which told us about the overall distribution of metals in the halo. Light from the background galaxy (“source plane”) is deflected and magnified by an intervening galaxy cluster (“lens plane”), to form the bright giant arc that is seen in the projected image (the right-most panel). Q. Tell us about your results. Did you find out anything interesting? A: This is the first time anybody has studied many different positions within a distant galaxy halo to find out about its structure. Since this was the first time, the data reduction and further analysis were slower than usual because we had to make several tests — but it was still quite exciting! We found that the amount of magnesium in G1’s halo decreases with distance from the main part of the galaxy. We knew about this behaviour from studies using quasars, but our experiment allowed us to check it for the first time in this single halo. We also confirmed that the gas in the halo of G1 is clumpy — meaning there is an uneven distribution of heavier elements. Yet, heavier elements like metals are produced in galaxies themselves, not in halos. So we began to investigate how they could have travelled outwards. We asked ourselves: is the velocity of the gas in the halo the same as the velocity of G1 itself? No. What about compared to possible outflowing gas? Also no. Instead, we found that the velocity of gas in the halo is “quiet” — the gas seems to be locked to a huge structure that doesn’t seem to move much with respect to the galaxy system. The gravitational arc of the background galaxy stretches across the field of view, its light shining through G1. By taking spectra from different positions along the arc, astronomers have found clear evidence for magnesium absorption. The more absorption of light by magnesium, the lighter the pixel. A: We were definitely surprised by our results because we found metal-enriched gas far from G1 and yet the lack of movement in the system gives no explanation of how the gas got so far away — we expected to see some signs of outflowing material, but we didn’t. Also, it seems that metal-enriched gas is present only in certain directions from G1, which will be very relevant to the way people design absorption surveys using quasars as background sources. Our new approach to probe distant galaxy halos with arcs won’t replace using quasars as background sources — because distant quasars are way more numerous than gravitational arcs, blind surveys of quasar absorption lines remain particularly important in the field. This said, our results on the directionally-dependent geometry of this particular halo will have to be taken into account when interpreting why not all quasar sightlines encounter absorbing material, despite passing close to a known galaxy. Q: Why is MUSE the only instrument that can undertake such studies? A: The MUSE instrument, which is mounted on one of the VLT’s Unit Telescopes, is an integral-field spectrograph. This means that it is capable of taking thousands of spectra at the same time for each pixel in a given area on the sky — resulting in a 3D “datacube”. In particular, MUSE can take some 100 000 spectra in one shot of a 1x1 arcmin field of view (an area just a bit bigger than the size of Jupiter as it appears in Earth’s sky), covering what we call the visible wavelength range. Now, why is this important to our study? 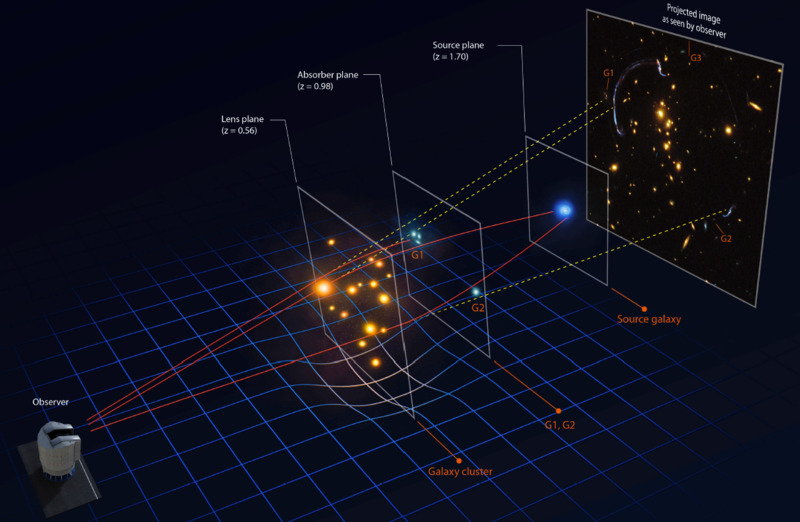 Our source, the gravitational arc, is as extended over about 1 arcminute — so it fits nicely in one MUSE field of view! We also needed spectra of every position on the arc to probe the intervening absorption, and of every galaxy in the field to discover the absorbing galaxy, and MUSE was the only instrument in the world able to provide these kinds of data. Our final datacube can also be seen as a “stack” of lots of images of the arc, taken with different filters at different wavelengths. Because wavelength is related to radial velocity via the Doppler effect, in practice we sliced the absorbing halo by velocity, ending up with a tomographic view of it. With its superb capabilities, MUSE allowed us to do this in quite a straightforward fashion. In passing, I would like to thank ESO staff for obtaining these data for us so efficiently. No doubt MUSE is currently one of the most requested instruments on ESO telescopes! 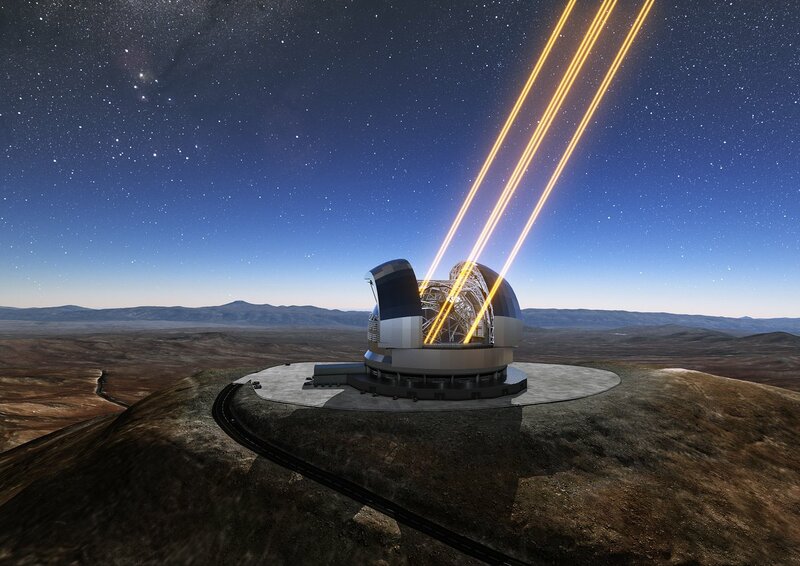 Artist’s rendering of the Extremely Large Telescope, which may be used to probe gravitational arcs and galaxy halos in the future. Q. What are the next steps in this area of astronomy? What are you excited to see? A: Well, we want to repeat this experiment using more arcs! Our team has already found some suitable candidates. We expect these arcs to have different configurations and also to reveal different kinds of absorption systems. Bright and extended arcs are rare objects today, but future wide-field surveys will discover hundreds of them. Some of those new arcs will be perhaps too faint for MUSE but are certainly a good case for an integral field unit on the future Extremely Large Telescope. Besides opening a new observational dimension in studies of galaxy halos, we expect these results to tell us more about galaxy evolution. 1920 Year of “The Great Debate” between Shapley and Curtis. 1965 Year that Bahcall and Salpeter first detected a distant galaxy halo. 10 000 The number of normal galaxies that a quasar can shine as brightly as. 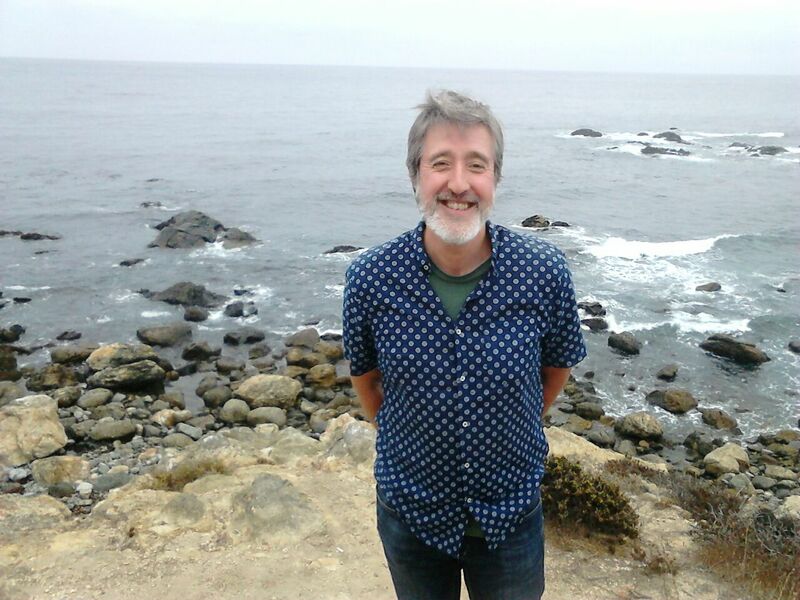 Sebastian Lopez is Professor of Astronomy at the Universidad de Chile. He is an observational astronomer and received his PhD from the University of Hamburg, Germany. His main line of research is focused on galaxy formation and evolution via studying the high-redshift circumgalactic medium. More information on his work can be found at this link.